Oatmeal Raisin Chocolate Chip Cookies-Soft and chewy and full of oats, raisins and chocolate chips. Oatmeal Raisin cookies have been on my list of things to bake for a while. I wanted to make a batch just to show some love to the oatmeal raisin cookie. That poor cookie, it’s always the last one on the cookie tray. I bought some raisins a few weeks ago and decided on a recent snowy day that it was a great day to bake cookies. I must have been craving chocolate that day, too because I had no intentions to add chocolate chips to the cookies back when I bought that box of raisins. Yet, they ended up in there and I’m not sorry. Oatmeal Raisin Chocolate Chip cookies for the win! The cookies turned out great and I’m not sure if I’ll ever make just oatmeal raisin cookies. Ahh, who am I kidding?!? I love cookies and I am sure I will make them eventually. After all, I just shared these cookies with you and now I am back today with more cookies. 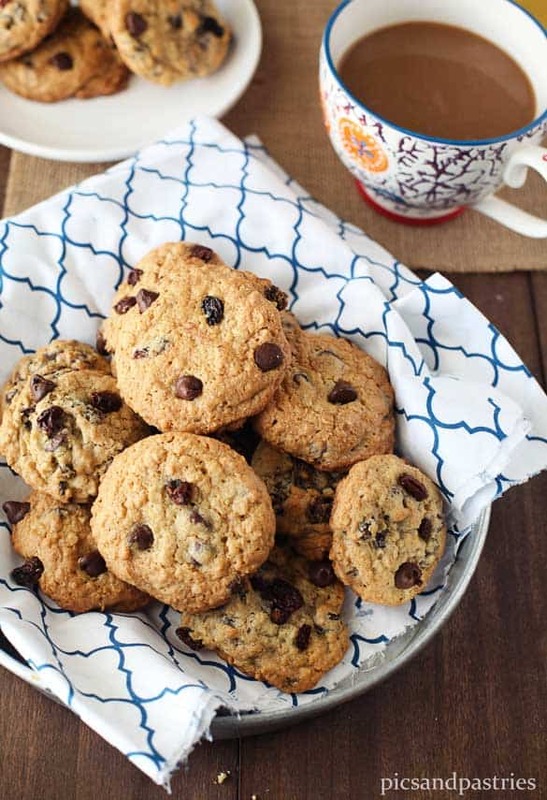 Oatmeal Raisin Chocolate Chip Cookies are soft and chewy and loaded with flavor. I actually really liked the chewy raisins mixed with the chocolate chips. Don’t let the raisins scare you away from trying these cookies. I promise, they’re GOOD! Enjoy the cookies and the raisins, sweet friends! I hope you Wednesday is fabulous!! Beat butter, sugar and brown sugar at medium speed with an electric mixer until creamy. Add eggs and vanilla, beating well until blended. Combine flour, baking soda, oats and salt in a medium bowl. Drop by spoonfuls onto a baking sheet lined with parchment paper. Allow to cool on baking sheets for one minute and remove to wired racks and allow to cool completely.